The Rusan QR adapter is the perfect choice for mounting clip on devices such as the Xclip CL42 or any other device with an M52x.075 thread. 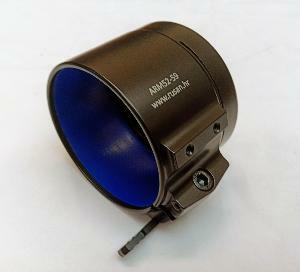 These adapters are precision machined to the exact size of the day scopes objective outside diameter rather than use an over size adapter with reducing rings. This means that only 2mm of clearance is needed between the rifle scope objective lens and rifle barrel. Please measure carefully with a vernier before ordering and choose your size from the drop down list above. If you are unsure of which size you need or your exact size is not listed, just contact us with your scope make and model and we will be happy to help.